A major part of passenger train traffic in Germany is nowadays hauled by electric multiple units. This one is a fairly rare type - at least in DB's colours. It is a third generation FLIRT train of Br 1428 built by the Swiss company Stadler. 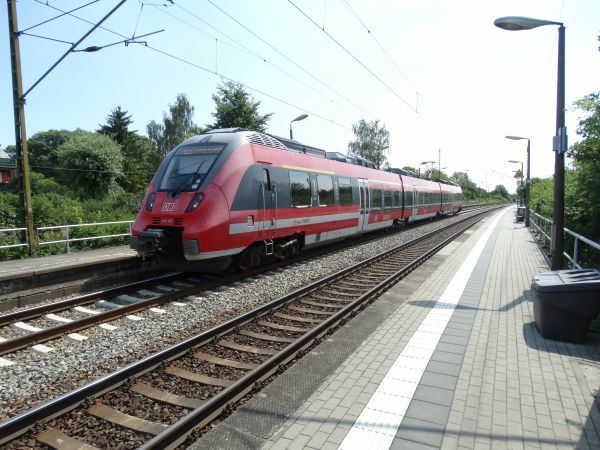 DB does not have many Stadler built trains, but they are very common at private railroad companies. Photo at Münster Hauptbahnhof 8.10.2016 by Ilkka Siissalo. 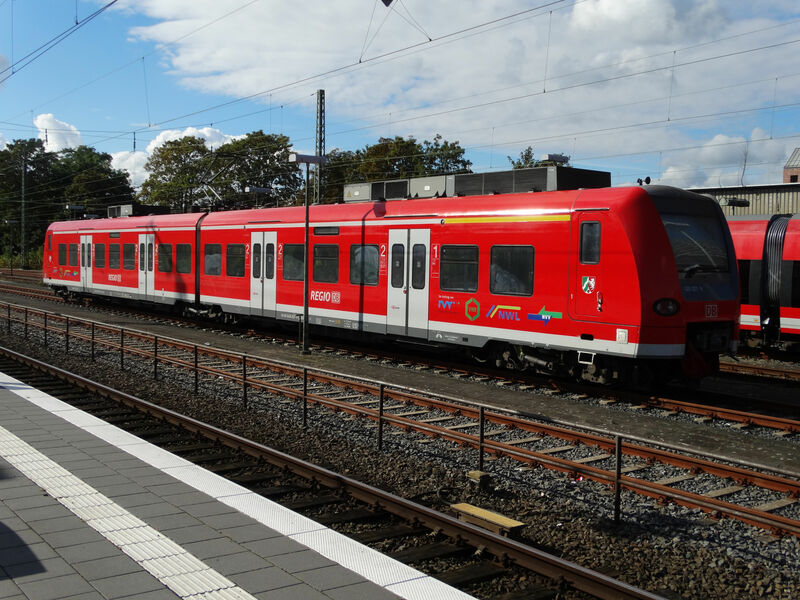 Almost all of DB's EMU trains are painted red, but not quite. These class 429 trains of the Süwex service have just a small red patch. Essentially this train is identical with the class 1428 shown at the top of this page. 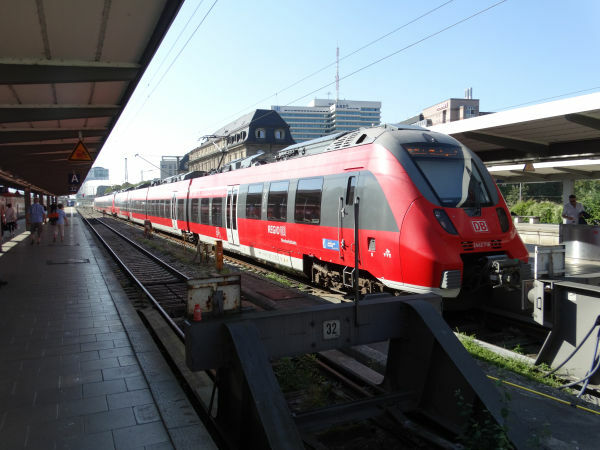 It is classed as Br 429 but it is also a Swiss Stadler FLIRT of 3rd generation just like the Br 1428. 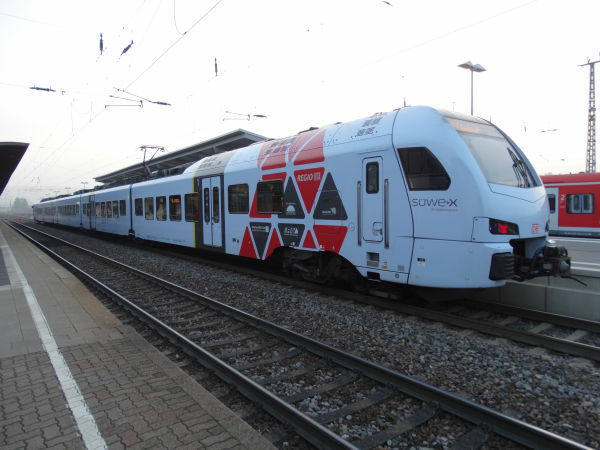 The Süwex service connects the western state of Saarland with cities such as Mainz, Ludwigshafen and Karlsruhe in the east. Picture 17.12.2016 at Saarburg station by Ilkka Siissalo. 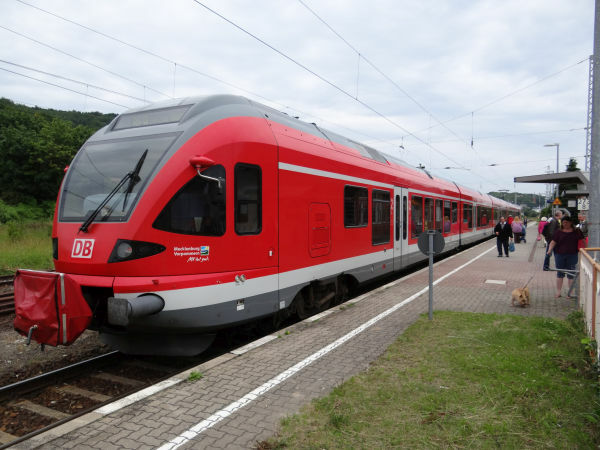 This one is also called Br429 and also this one is a Stadler FLIRT, but this is a first generation FLIRT paid and owned by the Mecklenburg-Vorpommern state. 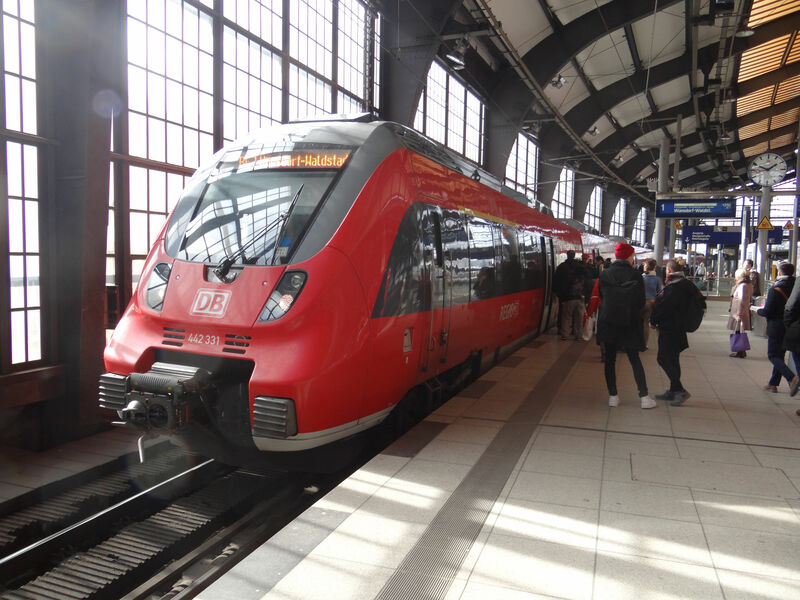 Here it has just arrived as a regional train to the Sassnitz station on the island of Rügen on the very northeastern corner of Germany. Picture from Sassnitz station 3.7.2013 by Ilkka Siissalo. The class 426 is a two coach variant of a common regional train. The most common variant is the class 425, which has four coaches. 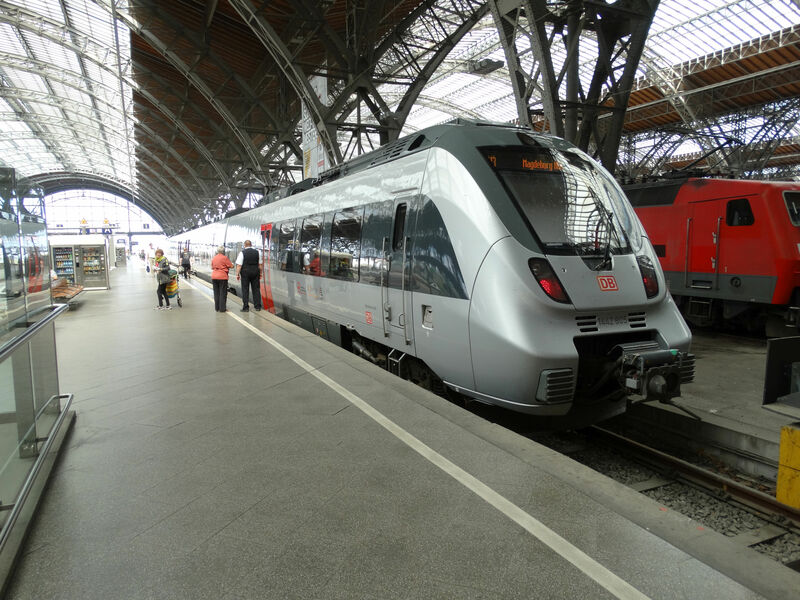 These trains were built by a consortium including Bombardier, Siemens and DWA 1999-2008. Picture at Münster Hauptbahnhof 8.10.2016 by Ilkka Siissalo. This is the class 425. It is similar to the class 426 shown above, but with four coaches. It is one of the most common EMU types in Germany. 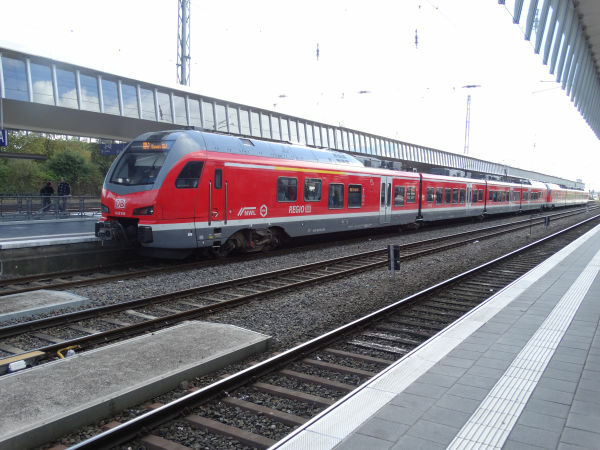 Picture of two four coach Br 425 units at Karlsruhe Hauptbahnhof 8.7.2015 by Ilkka Siissalo. This is a class 2442 Bombardier Talent 2. Don't please ask me what the difference between a class 442, 1442, 2442 or 9442 is, because there is no sensible and logical explanation. Anyway, this is a Bombardier Talent 2, four coaches, a fairly new regional train. Picture at München Hauptbahnhof 13.9.2016 by Ilkka Siissalo. Another four coach long Bombardier Talent 2, but this time classified as Br 442. Berlin Hauptbahnhof 4.3.2016. Picture by Ilkka Siissalo. Yet another Talent 2 train of DB, but this is in the local grey colours of the Mitteldeutschland region and is now called Br1442. 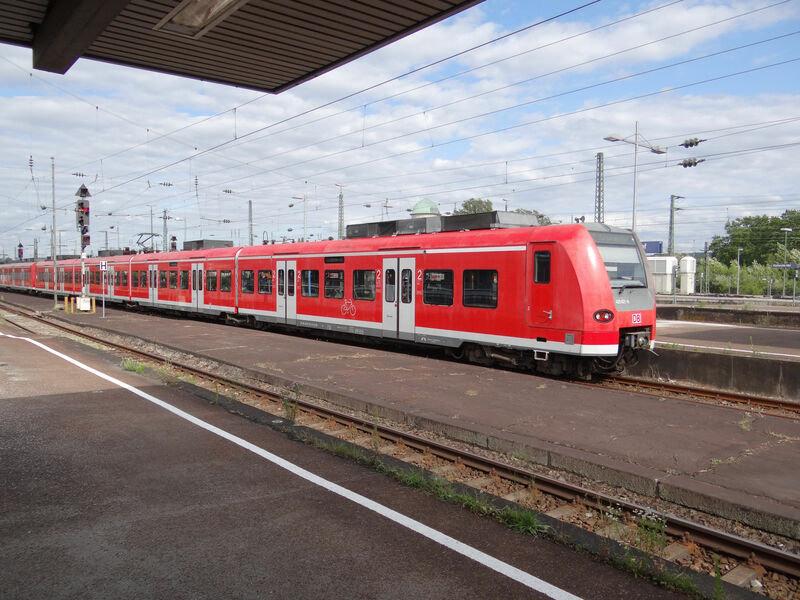 This is also a Talent 2 train of DB belonging to the class Br442, but this one is from the local and regional traffic around the city of Dresden. In Dresden area the trains have a broad extra white band along their "belly". Picture from Dresden-Stetzsch 16.7.2018 by Ilkka Siissalo.